German Chancellor Merkel, champion of Muslim immigration to Europe, calls the attack "incomprehensible." Is it? The reactions by Western leaders and media to the latest Islamic terror attack essentially "signal in the strongest way possible to organizations such as ISIS, Al Qaeda, Boko Haram, Hezbollah and Hamas, that with every devastating attack, the West is ripe for the taking." So writes lawyer and political analyst Judith Bergman for the Gatestone Institute. Among the political reactions to the attack at a rock concert in Manchester, in which 22 young people were killed and 59 wounded, the vast majority of them did not mention the fact that it was perpetrated by a Muslim. Most were along the lines of the response by President of the European Council Donald Tusk, who tweeted, "My heart is in Manchester this night. Our thoughts are with the victims" and that of British Home Secretary Amber Rudd, who called it a "tragic incident." German Chancellor Angela Merkel's response was perhaps the most telling, given that she has been leading Europe's drive to accept large numbers of Muslim immigrants. 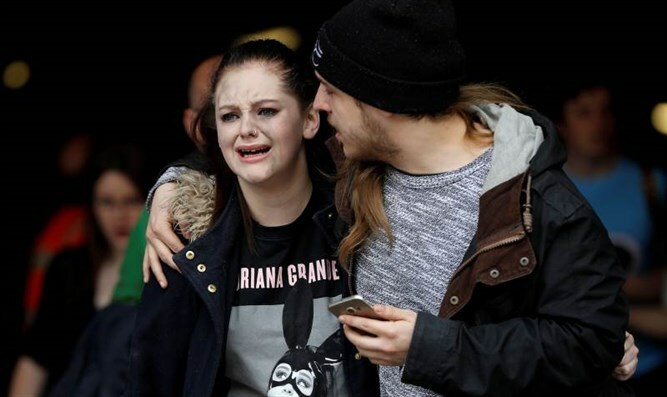 She said she found the attack "incomprehensible," and was watching the developments in Manchester "with grief and horror." Two months ago, after attacks in London in which four people were killed, British PM Theresa May said, "It is wrong to describe this as Islamic terrorism. It is Islamist terrorism and the perversion of a great faith." Even U.S. President Trump did not respond with his usual firmness, according to some observers. ABC’s Chief White House Correspondent Jonathan Karl actually appeared to praise him for his relatively mild response: “It’s striking how different this was from the way we have seen Donald Trump respond to previous major terrorist attacks," Karl said. "There was no reference to radical Islamic terrorism, no talk of profiling." Karl said that unlike previous Trump announcements, "there was no rush to judgment and no suggestion whatsoever that Islam was responsible." ABC Anchor George Stephanopoulos appeared more concerned that the attack was "likely to inflame anti-Islamic sentiment across Britain, across Europe," while NBC's Today Show featured counterterrorism expert Richard Clarke, who had the same concerns: "…The talk against Muslims in the last year in the campaign and since, has been very counterproductive. The only way to solve this problem is to have everyone think they're on the same side." "hundreds of pagans gathered for a concert of prostitution and vice." Bergman writes that given this explanation, as well as the many Islamic attacks since 9/11, including the Madrid train bombings (nearly 200 killed), the London subway attacks (56 dead), and dozens of others, "let alone countless attacks in Israel, Western leaders have run out of all conceivable excuses to be shocked and surprised at Islamic terrorism occurring in their cities at ever-increasing frequency." "It is impossible to fight back against that which you refuse to understand or acknowledge - but then again, European leaders seem to have no intention of fighting back, as they have evidently chosen an entirely different tactic, namely that of appeasement. "Every time a European leader publicly endorses Islam as a great faith, a "religion of peace", or claims that violence in Islam is a "perversion of a great faith", despite massive evidence to the contrary -- the actual violent contents of the Quran and the hadiths, which include repeated exhortations to fight the "infidels" -- they signal in the strongest way possible to organizations such as ISIS, Al Qaeda, Boko Haram, Hezbollah and Hamas, that with every devastating attack, the West is ripe for the taking. "…While European politicians, incredibly, believe that their tactics are preventing terrorism, they are in fact empowering it as much as possible: Terrorists do not react to heartfelt sympathy, teddy bears and candlelit vigils…. Islamic terrorism is not "mindless violence" but clearly calculated terror to force the eventual submission of the targeted society. So far, with the West inert and in denial, the terrorists seem to be winning."